Biotin is an essential vitamin that is, on the one hand, relevant for the metabolism, gene expression and in the cellular response to DNA damage and, on the other hand, finds numerous applications in biotechnology. The functionality of biotin is due to two particular sub-structures, the ring structure and the side chain with carboxyl group. The heterocyclic ring structure results in the capability of biotin to form strong intermolecular hydrogen and van der Waals bonds with proteins such as streptavidin, whereas the carboxyl group can be employed to covalently bind biotin to other complex molecules. Dissociative electron attachment (DEA) to biotin results in a decomposition of the ring structure and the carboxyl group, respectively, within resonant features in the energy range 0–12 eV, thereby preventing the capability of biotin for intermolecular binding and covalent coupling to other molecules. Specifically, the fragment anions (M–H)−, (M–O)−, C3N2O−, CH2O2− , OCN−, CN−, OH− and O− are observed, and exemplarily the DEA cross section of OCN− formation is determined to be 3×10−19 cm2. 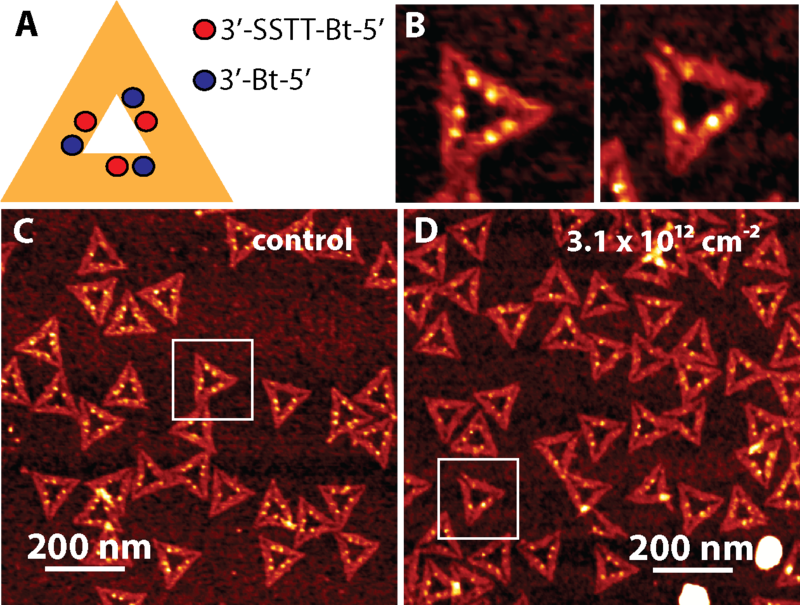 To study the response of biotin to electrons within a complex condensed environment, we use the DNA origami technique and determine a dissociation yield of (1.1±0.2)×10−14cm2 at 18 eV electron energy, which represents the most relevant energy for biomolecular damage induced by secondary electrons. The present results thus have important implications for the use of biotin as a label in radiation experiments.